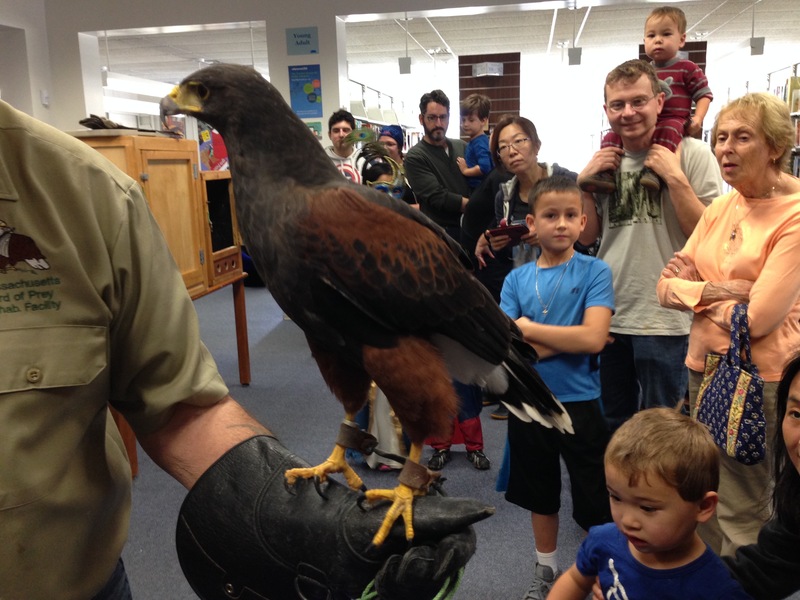 The Southborough Open Land Foundation (SOLF) presented Tom Ricardi, founder and operator of the Massachusetts Birds of Prey Rehabilitation Facility in Conway, MA, with a program on Birds of Prey at the Southborough Library, September 15, 2018, at 2:00 PM. A large number of children and adults were in attendance to see the variety of birds Tom presented. You can watch a video of Tom’s presentation here. On a damp and cool Saturday morning, Jeff Collins, Director of Mass Audubon’s Ecological Management Department led a group of 16 participants on a “Bird-a-thon” day bird walk at the Breakneck Hill Conservation Land, on Breakneck Hill Road, Southborough. 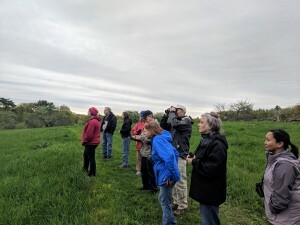 Altogether, we saw 28 species including a number of Bobolinks, a Yellow Warbler, Indigo Bunting, and an Eastern Bluebird. Our 2018 Annual Meeting featured Dr. Martha Gach, Conservation Coordinator , Mass Audubon/Broad Meadow Brook Wildlife Sanctuary and Conservation Center speaking on New England Pollinators and how to support them. SOLF members learned about hummingbirds and the many types of native bees and butterflies in their role as pollinators and what we can do to help them thrive. You can watch a recording of the meeting here. 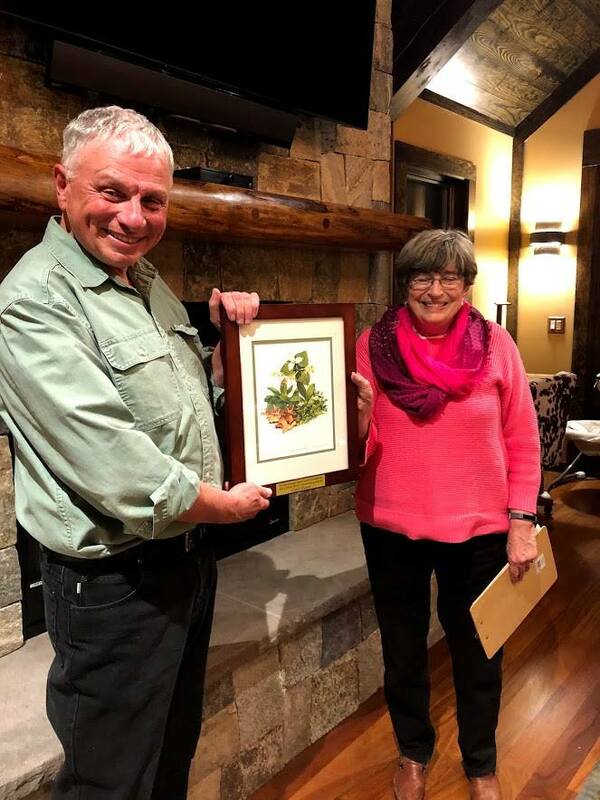 In addition SOLF announced the annual Elaine Beals Conservation Award to be given to Carl Guyer for his efforts to protect the environment by making Southborough a Green Community and encouraging recycling. SOLF also recognized two Algonquin High School students, Shannon Provencal and Kathryn Gowdy, for their outstanding efforts in organizing Hike Southborough Day in September 2017. 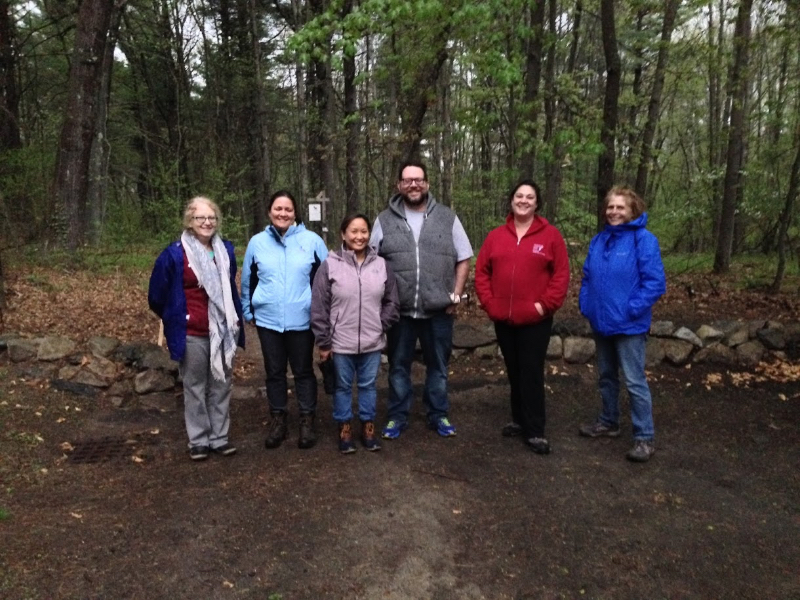 It was cloudy with a few light sprinkles, but we had a group who clearly enjoyed the quiet calm of walking in the woods with a bit of rain. Stay tuned! The Southborough Open Land Foundation (SOLF) presented Tom Ricardi, founder and operator of the Massachusetts Birds of Prey Rehabilitation Facility in Conway, MA, to a large and enthusiastic audience at the at the Southborough Library, October 28, at 2:00 PM. Tom Ricardi, a retired Fish and Game Warden with more than 30 years experience, is a licensed game rehabilitator and breeder. He brough with him a variety of live birds of prey including a Golden Eagle, a Barred Owl, a Harris Hawk, a Turkey Vulture and several other birds under his care. The picture below shows a Harris Hawk that suffered an injury and is unable to fly or live in the wild. The photo is courtesy of Sally Watters. Watch a video of the presentation here. Our thanks to Southborough Access Media for recording this program and posting it to YouTube. The Southborough Open Land Foundation extends a tremendous THANK YOU to Catherine Kundrath Weber for pulling off a highly successful “Art on the Trails” project. From original concept, to all the many threads that must be coordinated, to perseverance throughout the entire process to even a celebration walk and poetry reading at the end, she maintained enthusiasm and a “can do” attitude. Because of this, many residents of our town discovered the Beals Preserve for the first time and found a safe place of natural solace to revisit and cherish. Catherine, you are a champion of Art and Nature. 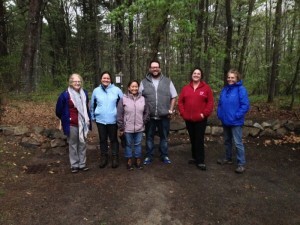 The Southborough Open Land Foundation (SOLF) presented naturalist, tracker and teacher of wilderness skills Paul Wanta in an exploration of the wildlife and plants that inhabit Beals Preserve, Southborough, MA. Paul Wanta has taught wilderness and tracking skills to young people for over 30 years. He lead us through the trails of Beals Preserve looking for the tracks and signs of the wildlife present in the Preserve. 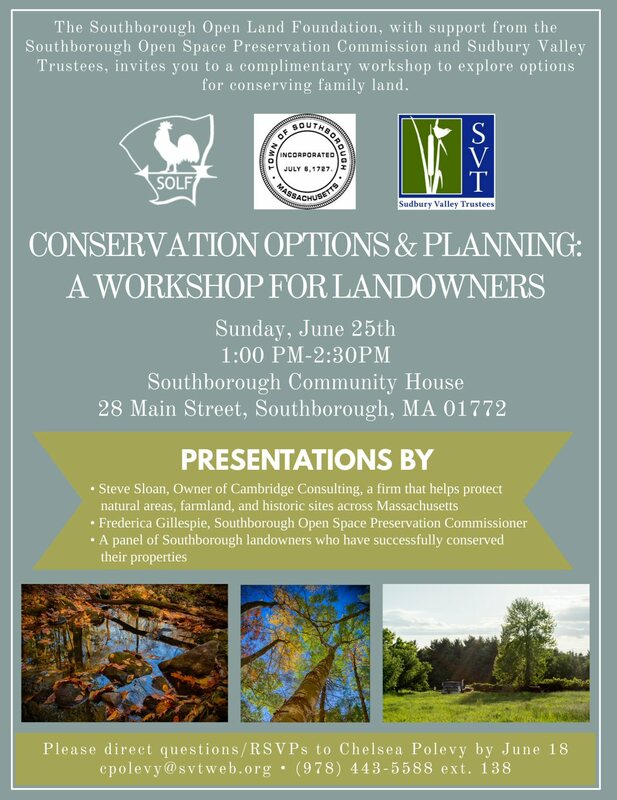 The Southborough Open Land Foundation, with support from the Southborough Open Space Preservation Commission and Sudbury Valley Trustees, invites you to a complimentary workshop to explore options for conserving family land, Sunday, June 25, 2017, 1:00 PM to 2:30 PM, Southborough Community House, 28 Main Street, Southborough, MA 01772. Presentations by Steve Sloan, Owner of Cambridge Consulting, a firm that helps protect natural areas, farmland, and historic sites across Massachusetts; Frederica Gillespie, Southborough Open Space Preservation Commission; and a panel of Southborough landowners who have successfully conserved their properties. Please direct questions/RSVPs to Chelsea Polevy by June 21. Email: cpolevy@svtweb.org or call (978) 443-5588 ext.138. For a flyer on the event, click here. This workshop is made possible by a generous grant from the Foundation for Metrowest, Southborough Community Fund.